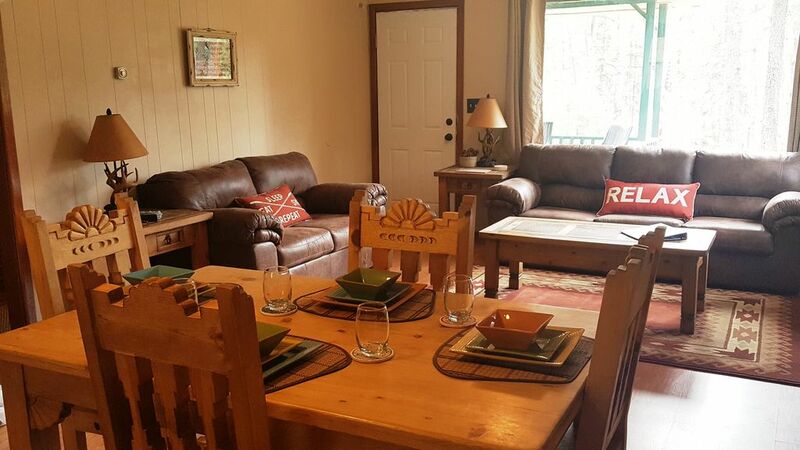 A clean, comfortable mountain cabin surrounded by the tall, cool pines Ruidoso is famous for, with everything you need for that family or romantic getaway, Sleepy Hollow is located in the most desirable section of Ruidoso - the Historic Upper Canyon. Stroll the upper canyon, a casual walk into town or just a short drive to all Ruidoso has to offer. Our well stocked kitchen, private sparkling clean oversized hot tub, relaxing porch and private back yard with grill and fire pit will surely give you family time or romantic vacation you want, but still close to town and less than 10 minutes to the Ski Apache turn off. Sleepy Hollow is just a short walk to the Ruidoso river and just minutes away from area activities, skiing, snowboarding, snow tubing, hiking, shopping, dining, casinos, paddle boating, state parks and the 3rd longest zip line in the world! Hike through the back yard, walk through the Upper Canyon, relax on the front porch and watch the wild life, enjoy the steamy, sparkling clean hot tub and grill on the back deck. A quick drive or casual walk to both uptown and midtown Ruidoso for shopping, dining and night life. We even have a permitted fire pit you may use when fire restrictions allow. For outside fun, the backyard is the perfect place for cookout and hot tub relaxing. Even great for a family hike. The peaceful neighborhood is not a thru street, it has very few cars coming and going, so it's also the ideal place for the kids to play or for the family to enjoy an evening walk through the Upper Canyon. Inside we have a 50" Smart Roku TV (bring your Netflix account!) with HULU and 1000's of tv shows, movies, sports and more to choose from without renting DVDs. We have Free WiFi (secure) and bluetooth for playing your favorite music. Championship Golf, Casinos, Skiing, Snowboarding, Tubing, Hiking, Biking , Horseback Riding, Horse Racing and much more nearby. Sleepy Hollow is tucked away in the historic Upper Canyon close to the Ruidoso river. It is clean, comfortable and in a great location. *Oversized Hot Tub, and No extra fee! **Your small-medium size dog (50lbs or under) is welcome, with permission only. Pet fee applies. **Please Note: New central A/C is going in April 10. From 3/28 - 4/10 we have central heat but no air conditioning. **Check in/Check out on July 4th, Labor Day, Memorial Day and New Years day require an overtime cleaning fee if there is a back to back rush holiday cleaning. **Maximum occupancy is 6, with a maximum of 4 adults. Home does not accommodate more than 4 adults well. If you book with more than 4 adults, there is a $25 flat fee additional. ** It is the responsibility of our guests to have 4WD, snow tires or tire chains during inclement weather. The location on this property was so great, we could not pass it up. The location of this home is excellent. Its just the right size for one or two couples or a small family. The Village of Ruidoso is a short pleasant walk or take a walk through the historic Upper Canyon. 100% cotton sheets and blankets. All 100% cotton towels from Kohls. Plenty of them! Sleeper sofa and love seat with 50" ROKU smart TV, TDS cable, Bluetooth tower. We do have salt, pepper and various spices for our guests use. Table with 4 chairs plus 2 extra folding chairs in house. No Cable, but we have 2 Smart TVs with ROKU. 1000's of movies and TV shows to choose from, with live TV, HULU, Sony Crackle, ABC/NBC News and so much more. Better than Cable! Ski Apache - the turn off to the best warm weather skiing in the country is just about 6 miles away! Ruidoso Winter Park has great tubing, just up the road in Alto. The most requested area of Ruidoso is the Upper Canyon and Sleepy Hollow is right where you want to be. Our cabin is clean, it is comfortable and it is priced right. The hot tub will keep you relaxed and the many activities in Ruidoso will keep you occupied. Please ask if you have any questions at all. *Your small to medium size dog (50lb or less) is welcome, with fee. **This home is located in an area over 7500 feet above sea level. There is the potential for a lot of snow. **Owner is not responsible for weather, road conditions, road work or detours. It is the responsibility of our guests to have 4WD, snow tires or tire chains during inclement weather. **We provide Ice Melt for the walkway and outside steps and a snow shovel for your convenience. We do our best to have the driveway cleared but help is limited in Ruidoso and it will be done as soon as humanly possible when there is more than 4" of snow. We will definitely be back loved the little place. The cabin is in the perfect location and so peaceful there. The kitchen is stocked very well and place so clean. It is an amazing cabain perfect for a couple or a family. It has everything you need and the jacuzzi is delicious and Doris the owner is a very kind and patient person! I really want come back. Thank you so much Minerva, I hope you can come back again soon. It was a pleasure having you as a guest. Amaizing cabain!! Everything was very clean, it feels like home, the hot tub was delicious.... I will come back many times!!! I'm so glad you enjoyed our cabin and your visit. Please do come back anytime! Hi Elena, I'm happy you enjoyed the cabin! Please come back again soon! Very nice family vacation spot. Good location and well kept, clean comfortable cabin. I've been to many in the area before and we always had to clean something or call property manager to have something fixed or supplies brought in, which is why I will be back here again and again. We just came and had fun, nothing was broken and nothing needed cleaning. Thanks Jose, I'm so glad you and your family enjoyed our cabin. You are welcome back anytime! We stayed at SleepyHollow over Christmas. It was absolutely wonderful. Doris was so accommodating and very quick to respond to our questions and needs. The cabin was very clean and met our expectations. We will absolutely stay here again! Thanks for everything! We enjoyed having your family as our guest. I'm happy you liked our cabin and hope you had a wonderful Christmas. Hope to see you on your next visit to Ruidoso. Thanks again for being our guest. Tucked into the tall pines of Ruidoso in the historic Upper Canyon, Sleepy Hollow is a convenient location away from the hustle and bustle of Ruidoso during the busy months, or just a place to come and relax when you really need time away. Close enough to Uptown and Midtown Ruidoso to walk, or just take a long walk through the Upper Canyon. Great things to do in the area! Take a ride over to Lincoln County and see where Billy the Kid had his shootout; Hit the Casinos at Inn of the Mountain Gods or at the racetrack in Ruidoso Downs. Quaint shops and restaurants galore in Ruidoso. Best warm weather skiing in the country at Ski Apache; great family fun at Ruidoso Winter Park. And of course, some of the best golfing in the Southwest is very close by. PLEASE READ IMPORTANT TERMS: We apologize for any inconvenience, but due to cleaning crew availability: **No check out on Christmas Day, Easter Sunday or Thanksgiving without additional fee **Check in/Check out on 4th of July, Labor Day, Memorial Day and New Years day may require an additional $65 for OT rush holiday cleaning Please check with me prior to booking with check in /check outs on these dates. **If you would prefer to pay non refundable $59 damage protection rather than a $300 fully refundable fee, please let me know and I will change the settings for your booking. Thanks! Feel free to call me if you have any questions. ***INTERNATIONAL GUESTS: Fees over $10 charged to us for your use of an international credit card will be deducted from your security deposit ***Late Payments: Reservations not paid in full 15 days prior (30 for federal holidays) are subject to cancellation with no refund*** No refunds due to weather. We recommend that you come prepared for driving in adverse winter conditions. Chains and or 4-wheel drive vehicles may be required to go up to Ski Apache. Most likely not necessary for the neighborhood we are in but there is no guarantee roads will be cleaned quickly. We recommend you choose travel insurance separately. Credit Cards accepted online. We also accept personal checks and Pay Pal with a minimum of 15 days in advance drawn on US banks only. Pets allowed with $39 fee Non smoking cabin. Thank you!